These Triple Chocolate Banana Scones are moist, delicious and perfect for with a cup of coffee or a mug of tea! My kids love them as an after school snack. Bananas are the one fruit that I don’t love to eat. A while back, I read that one of my food blogger friends only eats “crunchy bananas” or ones that aren’t fully ripe. I can’t remember who it was that said it but I need to give it a try because I’m determined to like bananas! That being said, I LOVE using in smoothies and lucky there is always a banana or two that overripens and I get to use it for baking! 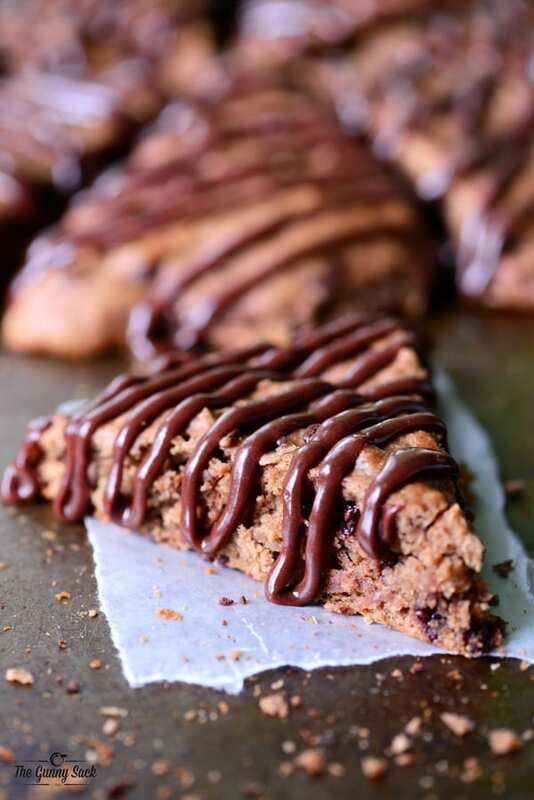 These triple chocolate banana scones are the perfect thing to grab for a quick breakfast or as a chocolatey snack. Whisk together the flour, sugar, cocoa powder, baking powder, and salt. Cut in cold butter. Mix in the mashed bananas, sour cream, chocolate chips, milk, egg, and vanilla until the dough starts to come together. Then, gently knead the dough until combined. 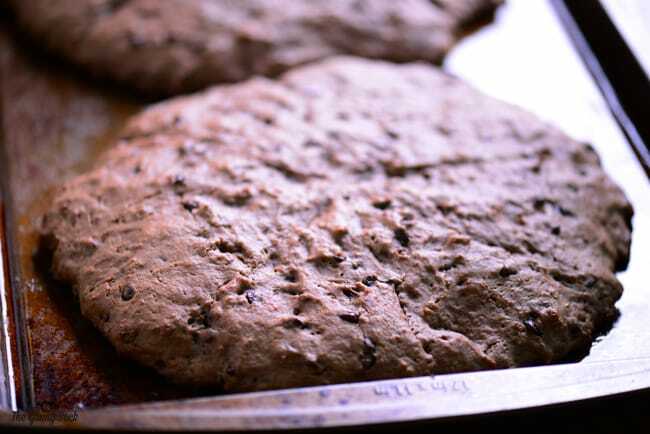 Divide the dough in half and form two 8-inch circles on a greased baking sheet. Cut the loaves into wedges without separating them. Bonus kitchen tip: Use a cheese grater to shred the cold butter into the flour mixture, and then use a pastry cutter to finish the job. Bake the scones at 425 degrees for 14-16 minutes. Allow the scones to cool and then cut them into wedges. 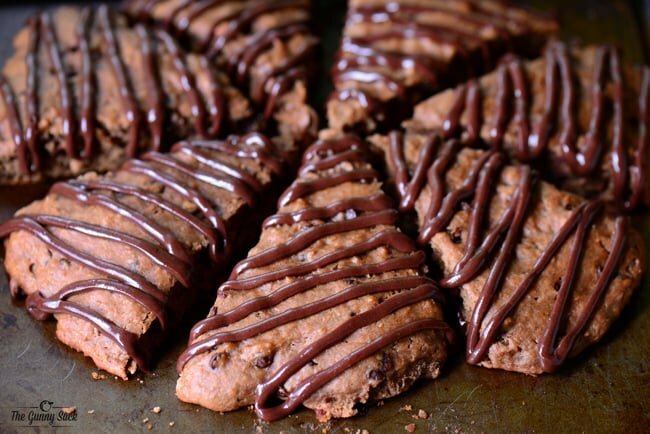 Melt chocolate chips in the microwave and drizzle on the scones. Bonus kitchen tip: Spoon the melted chocolate chips into a plastic sandwich bag. Snip the corner and pipe the melted chocolate across the scones. 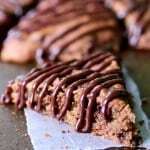 Triple Chocolate Banana Scones are a great way to use extra bananas and are the perfect way to start the day! This Toffee Scones recipe is the perfect thing to enjoy with a cup of steaming coffee. The sweet, crunchy toffee is delicious in the soft scones. Bakery Style Blueberry Scones from Pinch of Yum are crunchy sugary on the outside with juicy blueberries and a flaky tender inside. Scones meet banana bread in these low sugar Banana Nut Scones. This easy scone recipe is perfect for breakfast when paired with a cup of coffee! Strawberry Scones from Jo Cooks are the perfect scones to make during strawberry season. Great with a cup of good coffee. These Cinnamon Scones are light, fluffy, and super easy to make! They are the perfect thing to enjoy with a cup of coffee in the morning. Add whatever you want from chocolate chips to cranberries to make your favorite flavor. Whisk together the flour, sugar, cocoa powder, baking powder and salt. Mix in the mashed bananas, sour cream, chocolate chips, milk, egg and vanilla until the dough starts to come together. Then, gently knead the dough until combined. Divide it half and form two 8-inch circles on a greased baking sheet. Cut the loaves into eight wedges without separating them. Bake the scones at 425 degrees for 14-16 minutes. Allow the scones to cool and then cut them into wedges. 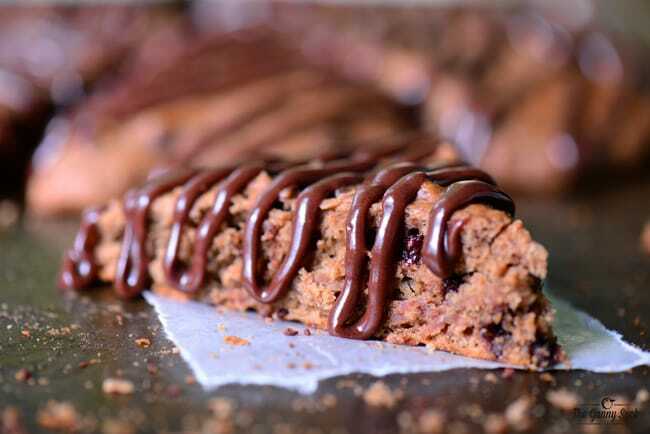 Melt chocolate chips in the microwave and drizzle on the scones. Say what? You don’t like bananas! That’s bananas 🙂 Of course they are always better in a delicious treat like these scones! This didn’t work for me, the batter was too thin. Sorry!